welcome back to essential simplicity. 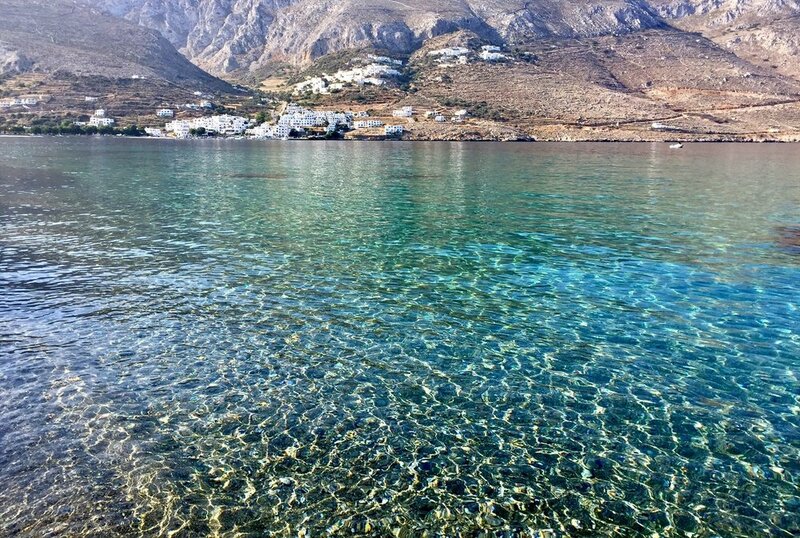 Restore your vitality in a setting of mythic beauty: Join Julia for a rich and unique retreat experience on the pure, light-filled island of Amorgos! Immerse yourself in the practice of yoga and the joyful Greek culture on this 8-night retreat, guided by Julia's deep knowledge of the land, history, people, culture and language developed over 25 years of personal pilgrimage to Greece. Greece is known as the land where the gods once walked the earth – and you'll feel like they still do! The retreat includes guidance in making your journey personally meaningful. Luxurious lodgings, authentic Greek culture, amazing hikes and swims, and delicious local food await. Step out of the bonds of daily habit to re-discover your clarity and freedom in the pure light of Greece. You'll return home revitalized and refreshed! • Fresh, lavish Greek farm-to-table meals (organic whenever possible). • A foodie's delight: we'll eat in creative local restaurants around the island in addition to our hotel's excellent cuisine. • Guidance in the 'art of pilgrimage': of soulful travel and making your journey personally meaningful. • Rejuvenation, fun, and deep relaxation – Greek island style! We'll begin the retreat with one night in Athens at a beautiful boutique hotel with spectacular views of the Acropolis. We'll have a gourmet dinner out in the romantic old city, taking-in the vibrant, local foodie scene. The following morning we’ll enjoy an expertly-guided tour of Athens' Acropolis, temples, museums, and sacred hills, getting insight into this ancient culture which holds the very foundation of western civilization. We'll take the ferry to the island of Amorgos, for a full week of our luscious retreat. Amorgos is a gorgeous and rare still-unspoiled island offering us a taste of traditional Greek life and culture amid dazzling natural beauty. The island has been known since ancient times for its powerful healing qualities, and the aromatic plants that grow wild here are among the most potent in the world. Our days on the island begin with energizing morning yoga in a beautiful studio overlooking the Aegean Sea, followed by a bountiful breakfast. The days include time to lounge on the pristine beaches right below the hotel, or poolside, get a massage, or simply relax. Feel free to participate as much or as little as you like in all of the offerings. Daily outings are planned including hikes on ancient footpaths to traditional villages, a private excursion by boat, day trips to hidden monasteries, pristine and remote beaches, local culture, a town with labyrinthine white streets, windmills and beautiful boutiques. On most afternoons we'll gather for a restorative yoga session to relax and integrate the day's experiences, and each evening we enjoy a sunset aperitif on the veranda followed by a delicious Greek dinner. Nights are filled with stars, and often local Greek musicians. You will have a deep and personal experience of this mythic land where the human hand has worked in harmony with nature for millennia. Our home for the week is a beautiful five-star resort, owned by a lovely local family who welcomes us as their own. A path leads to several amazing beaches. All rooms have gorgeous sea views. You'll have full access to the excellent spa and pools, and our delicious meals are organic as much as possible, straight from the family's gardens. All levels of yoga experience are welcome, and will be honored and provided for. 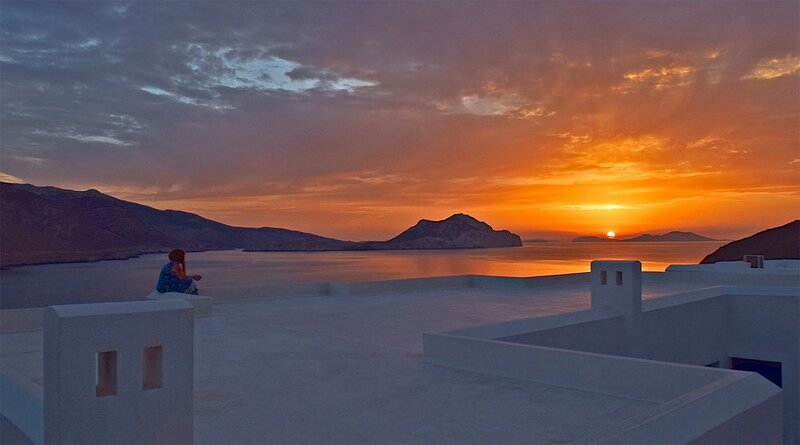 Amorgos offers a serene setting for deepening our practices of yoga. All sessions are held in a beautiful studio with spectacular views over the Aegean sea. Morning sessions will invigorate and energize with clear alignment instruction for all levels, including meditation. Early evening sessions will be restorative and relaxing to integrate the day and learn simple, take-home practices that help reduce stress. You'll cultivate mindful awareness of your body's innate intelligence, develop breath, focus and clarity, and enjoy the present moment while building stability and strength. Our purpose will be to support our greatest vitality as our bodies change along the path of life. "This retreat was the most beautiful week of my life!..." Please note that all prices will increase by $200 after January 1, 2019. Pre-register early to reserve your space and get this year's pricing. Please plan to arrive in Athens by noon on June 2, 2019, if possible. We highly encourage you to arrive a day early in Athens, on June 1, to acclimate to the time zone and enjoy more of the fascinating city of Athens. If you are going home right after the retreat, you will likely need to stay a night in Athens on the 10th, depending on boat/flight schedules, and plan to fly out on June 11. We encourage you to stay longer in Greece and visit other islands or the mainland before heading back to Athens – we can help coordinate all your post-retreat travel! For professional assistance organizing any of your travel in Greece, I can connect you with our great Greek travel coordinator, Voula. Please purchase travel insurance to protect your health and wellbeing as well as your investment, from unforeseen circumstances before or during your retreat. We highly recommend purchasing comprehensive travel insurance at the time you book your retreat. Suggested companies include: World Nomads, AAA, or ask your travel agent. The retreat is structured so you will have a wonderful experience with great ease. – All bountiful meals for the retreat (except one lunch out in Athens). – Serendipitous participation in local festivals, events, and opportunities as they come up! Not included in the price: Airfare to Athens, transfer from Athens Airport to hotel, tips, ferry back to Athens. We will coordinate it all for you, and be in touch with you about your travel plans to assist. Note: Travel insurance is not provided, please be sure to purchase your own high-quality travel insurance. The Greek Odyssey Retreat is very popular and fills quickly. Space is limited. Pre-register to receive this year's pricing. Find out how your participation gives back! "My love affair with Greece"
My love-affair with Greece dates back to my childhood, when I traveled here with my family for entire summers. Along with my nearly three-decades of yoga, I have a penchant for Greek mythology. I earned my B.A. in Philosophy before becoming a painter. As an artist, I attended the Aegean Center for Fine Arts on the Greek island of Paros, and I’ve since travelled to Greece annually for almost 25 years. I'd say I work the whole year for this moment – which is now my great joy and honor to share with you. For the light, the unmatched revitalizing effect of this mythic place, and for the deep joy experienced here with the Greek people. To receive occasional curated news & updates while they're hot! We respect your privacy. And bulletins will only be issued on rare occasion. ©Julia Ingersoll Retreats 2019, All rights reserved.